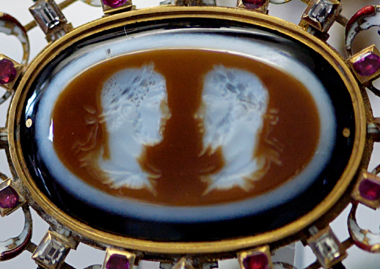 Geta was the younger of two sons born to the Emperor Septimius Severus and his second wife, Julia Domna. His older brother, the emperor commonly referred to as Caracalla, was a mere 11 months older. This closeness in age between the young and ambitious sons of an emperor eventually fostered rivalry between the two. 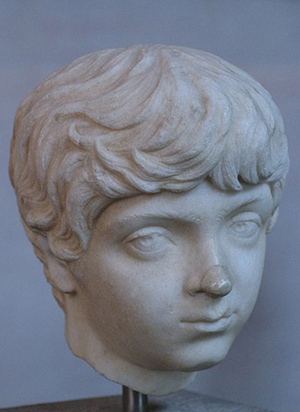 When Caracalla was 7, his father changed his name from Lucius Septimius Bassianus to Marcus Aurelius Septimius Bassianus Antoninus in an effort link his family to the beloved Antonines. His father, at the height of popularity after his successes against the Parthians, raised Caracalla, aged 10, to the rank of Augustus. This effectively made him his co-ruler and heir apparent. Geta was named Caesar, a lesser position. Although he was a second son and held a lower rank, as a member of the imperial family he enjoyed rank and privilege most of his life. As he and his brother grew into their teens, they clashed more frequently, threatening to shatter the carefully constructed image of a close nit and unified imperial family. 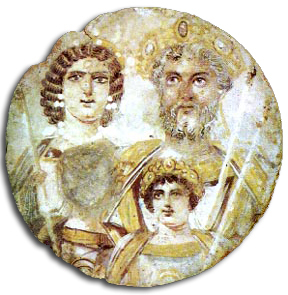 Along with his own coin issues and statues, Septimius Severus minted coins and commissioned works of art with images of his young sons, his wife, and the family together. He promoted not just himself but his family. This was to be a dynasty. Besides the general disdain each had for the other which drove them to plot the others demise, Caracalla would never share power with his younger brother as equals. Geta had no intention of taking the role of junior partner. He would not voluntarily take a lesser role to his brother as Lucius Verus did with his brother Marcus Aurelius a half century earlier. "if the one attached himself to a certain faction, the other would be sure to choose the opposite side"
This long sibling rivalry, Geta's short time as Augustus, and his life would come to an end just 11 months after his fathers death. 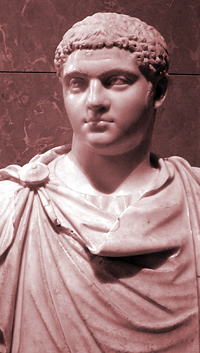 After at least one earlier failed attempt to take his brothers life, Caracalla had Geta killed some time in late December of 211. He was 22 years old at the time of his death. Caracalla managed to either purge, exile, intimidate, or pay off all those who still stood in his way. To the senate he justified his actions as self defense. He lamented that he had been the victim of a plot and his life were in danger. In essence he murdered his brother before his brother could murder him. He also took quick steps to pacify the legions offering them rewards for their loyalty. Septimius Severus issued coins bearing portraits of both Caracalla and Geta as young boys (examples of both can be found on this site). Both brothers also later issued coins themselves with adult portraits. In statues and adult portraits on coins, Caracalla is often depicted with and almost angry, furrowed brow, intense and imposing. Surviving depictions of Geta are often of an innocent looking child or a less imposing young man. He is seldom depicted quite as brutish as his older brother. This gives fuel to the common view of Geta as a young innocent victim of treachery and fratricide, committed by a brutish and homicidal older brother. Although he was indeed murdered by his brother, the truth is more likely that each conspired to kill the other. Geta simply failed to take his brother out before his brother got to him. "The son of Pertinax is said to have remarked as Caracallas titles were being read aloud -- Sarmaticus Maximus and Parthicus Maximus. 'Add to these also Geticus Maximus, that is to say, Gothicus.' "
"the troops felt very kindly toward the younger brother, especially as he resembled his father very closely in appearance." "As a youth, he was handsome, brusque in his manners though not disrespectful, incontinent in love, gluttonous, and a lover of food and of wine variously spiced. In his literary studies he held fast to the ancient writers. He was ever mindful of his father's sayings, always regarded by his brother with hatred, more affectionate than his brother toward their mother, speaking with a stammer though his voice was melodious. He was very fond of bright clothing — so much so, in fact, that his father would laugh at him." After Geta's murder many of his statues were destroyed, his name officially erased from inscriptions, and many coins bearing his likeness were melted down.